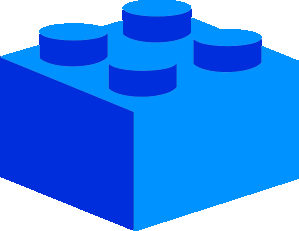 The Blue Brick | Welcome! Fire trucks racing along to the wildfire zooming past us. California's kinda pretty, isn't it? They had tasty truffles, and chilly ice cream. Good stopping point. America is full of gas stations. Read more about August 9th - Wildfire! Lassen Peak, 1500 feet up (that's after our climb!). In the foreground is Lake Helen. We overnighted at a local fire station's meeting hall, and they made us warm breakfast in the morning. Morning briefing, in a coonskin hat. Don't ask me where he got it. Pine forest in the morning transitioned to wildfire and later to bare rocks as we climbed. First time we saw mountains since leaving the Rockies! Idaho and Oregon are flat! Me, on a log, in a national park, biking across the country. The trail up to Lassen Peak is visible in the lower-right. A mudpot splattering away. Click to enlarge! According to Google Maps, I climbed 6100 feet today, and descended over 4000! The route took us all through Lassen Volcanic Park, an inactive volcano in California with mud-pots similar to Yellowstone's. It was gorgeous. The trailer around lunchtime. Final stretch! Someone was nice enough to set up a rest stop with drinks for all of us! A general store we passed through had these up on the wall. Topical. Leaving Modoc National Forest. Pretty place. Pedalling through pine forest. Some of my favorite scenery. Today, we rode from Alturas to Cassel, and ran across a nice lady who set up a beverage stand for Bike and Build. She pulled out a cooler full of assorted cold drinks and water, and invited us over to chat for a bit. August 6th - Last State! I bicycled to California! How crazy is that? How cool is that bear? Cool run-down deli we passed. We made it! After 3800 miles, we made it to our final state. Biking from South Carolina to California. Seriously. Who does that? Read more about August 6th - Last State! Waking to a wet morning in Wagontire. Yes, that's a big, blue tarp. Crepuscular rays over Wagontire - looked pretty cool. Lots of trucks on the road - we passed quite a bit of repaving. This machine consisted of an uncountable number of wheels and fiddley bits. Lake Ebert, on the right, is the largest lake in the area. When we passed, it was near-dry. Lake Ebert's dry bed is on the left, and a cool mesa is on the right. We bought the jaguar as a souvineir! Here's the fellow's workshop. Messy, with a laser cutter. A few people in the neighborhood put together a BBQ dinner for us. This was on the side of the barn. Todays highlight was a small gas station in Valley Falls, OR. The owner, a friendly older fellow, had a small high-tech shop set up with a laser cutter and some woodworking tools. He related that he made up woodburned signs for local businesses and crafted small jigsaw puzzles as a side business. There was quite an assortment, from animals to people and abstract patterns. The ride took us from Wagontire, OR to Lakeview, OR, a total of 85 miles on one road. It's a little dull, but very relaxing to ride on such long untraveled stretches of asphalt. Can I tell ya - middle of nowhere. Riley, complete with gas, RVs, and food. As close as you got to a town for 50 miles. And all sorts of odd visitors! The middle of nowhere can be really pretty. The sign reads "Wagontire International Airport". Don't ask me! It's, like, kinda, sorta a real place. Ish. We'd been hearing about it for the better part of the trip. How is was a one-man town, populated only by a grouchy old man who had Bike & Build do odd jobs before letting us stay the night. None of us were excited to show up, and a bunch of people took roadside naps under shade signs to stave off arrival. Things were surprisingly normal when we arrived - an older fellow and his son were working on fixing up the 6-room motel in hopes of opening it soon. An attached RV park had a handful of people staying. Along the way, we passed Riley, a five-man town with a post office, combination gas station/RV park/general store, and a few houses. The old place we stayed at. Really cool brick facade. Here's the inside: it's one of those huge gymnasiums with 30' ceilings. Today was Amanda's birthday, too. A bunch of us went out for pizza and cake. Little bit of a postindustrial vibe. Hey - the place is biker friendly! How cool is that? For our final day off (tomorrow), we stayed in Lincoln Jr. High. At least, it used to be a school. More recently, it's been used as overflow for the town hall, and a bit of a community center. We had the entire gym to unpack into, which was very spacious. Burns itself was small, but fun to walk around in. Helen and I spent the afternoon in a used bookstore and came back with Packing for Mars, Tuesdays with Morrie, and a few other titles. The road had very dark and steeply-banked gravel. I like the contrast and angles. Leah hanging out on the climb. Drinkwater Pass, 4212'. That's climb #1 done! I have no idea what this is but it looks cool. Sky, grass, sand, and a road to ride. That's it. Bike, water, and two good tires. You know those graphics that try to make you feel bad about the inordinate number of calories fast food desserts have? Yeah. We continued southward and westward today, coming up and over two small passes. For the next few days, we were mostly in the middle of nowhere, passing through ranching and farming areas with very few people. Next to the nicely-paved road was this post-apocylaptic looking track. Between the grass and the barren plains, civilization left this place behind. We started very early today, as evidenced by the near-full moon beginning to set. A house, a yard sale, and powerlines. This is a hopping place! Vale: 12 miles. Burns: 126 miles. Nothing in the middle. Gas stations sell the darndest things. The roadside supported hundreds of sunflowers. Probably planted from people snacking on the seeds and losing a few. Bicycle, road, horizon. It's meditative to be in such a barren place. Coleman's Service had a sign in the window announcing that the owner was out to lunch. It wasn't all sagebrush. We rode through Juntara, this pretty river-based oasis. And set up the tents for some well-earned rest. Today's ride took us out into the middle of nowhere. Our next real destination will be in California, and between here and there, we'll be riding through a lot of empty space and high desert. The world really is a circle! The greeks were right! conus.nitk.in is a simple visualization of the US, based off of NASA's data. 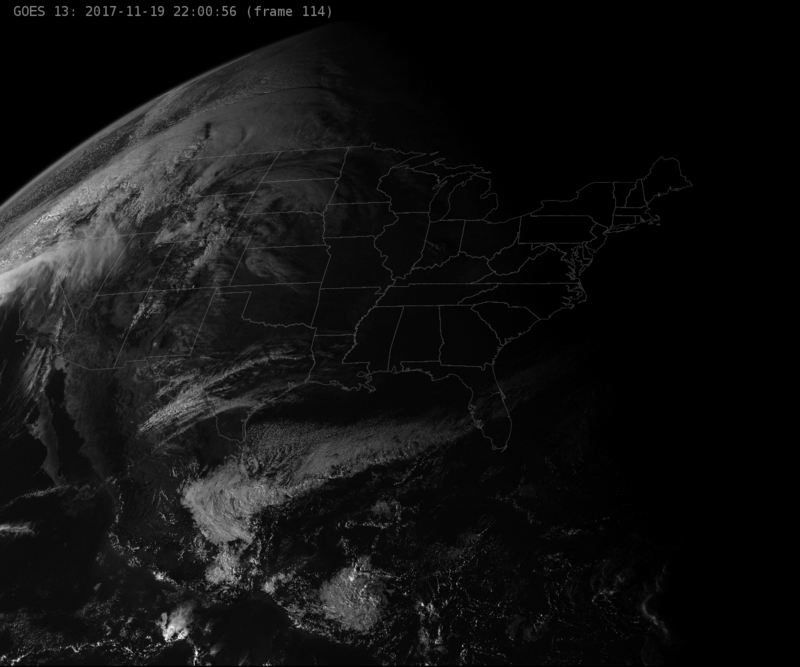 It scrapes the latest image from GOES-East, adds the timestamp, and displays it in an auto-refreshing format. The source script is called by cron every 5 minutes and lives here: https://alpha.nitk.in/liveusa.py In fact, all of the source images and data are visible from alpha.nitk.in - the below URLs are just pretty aliases to the .html pages. For a more exciting take, have a look at http://animatedconus.nitk.in/ - that site shows the past 24 hours or so of GOES data, and you can see the sun rise and set.